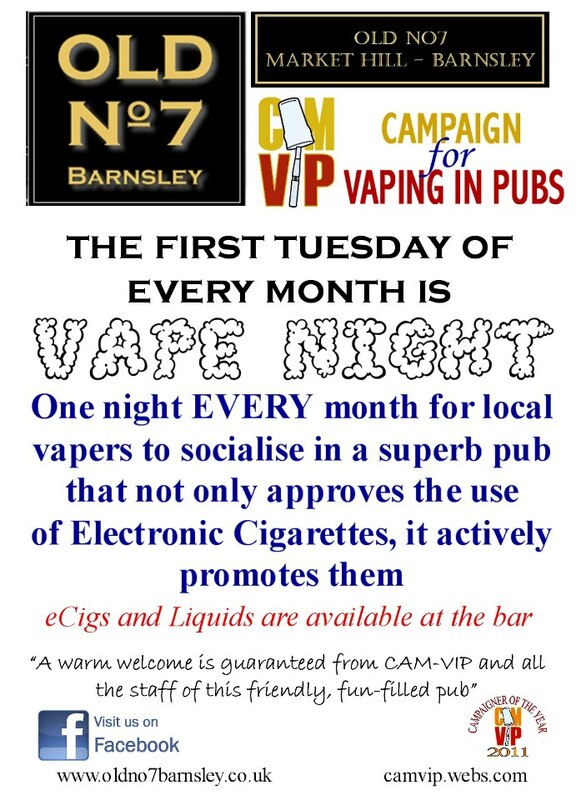 Two brewries in the Barnsley area have welcomed the use of electronic cigarettes in their flagship pubs with open arms. 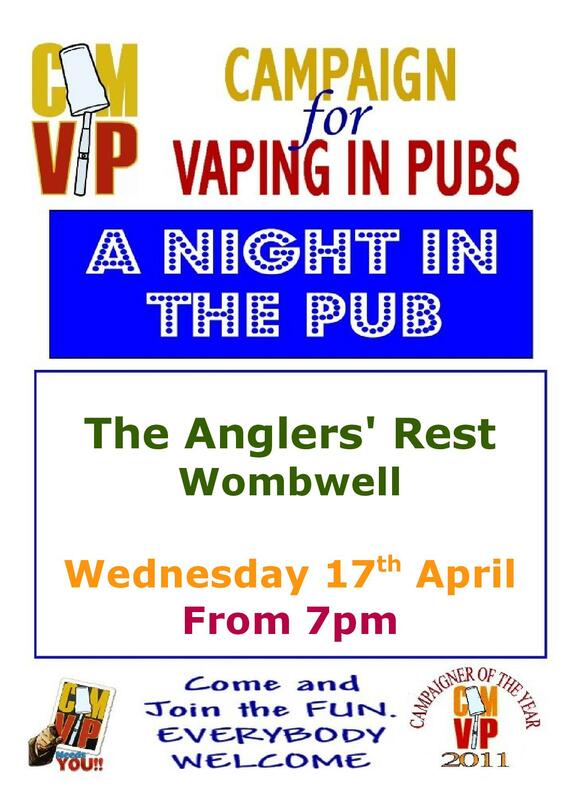 Acorn Brewery from Wombwell and Geeves Brewery from Stairfoot are both encouraging smokers to use electronic cigarettes in their CAMRA Award Winning pubs The Old No7 (Barnsley) and The Anglers' Rest (Wombwell) respectively. 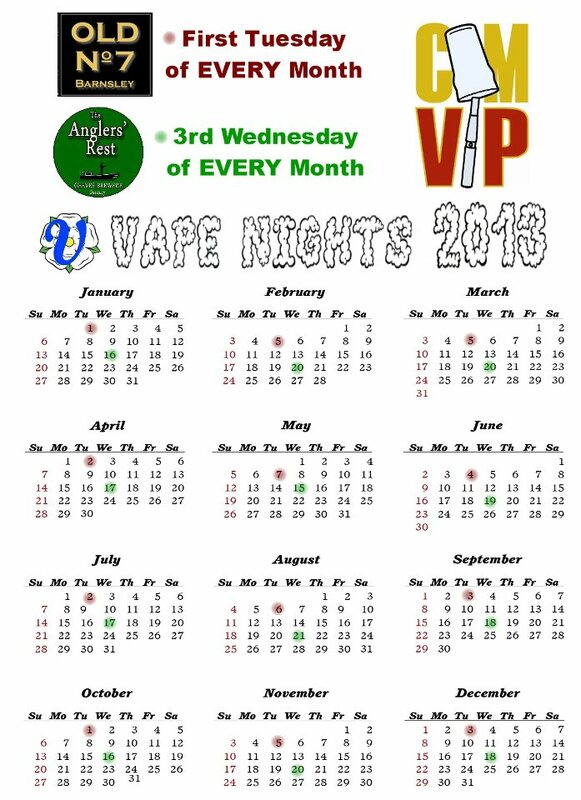 CAM-VIP is even holding monthly meetings in the two establishments, to educate and inform smokers and non-smokers about the benefits and pleasure that ecigs can bring to the pub environment. Hopefully together, we will help bring the atmosphere back into the pubs and re-integrate the pub-going community. The first night at The Anglers' Rest is Wednesday 17th April. Other pubs/communities throughout the UK are likely to follow suit during the course of the year. 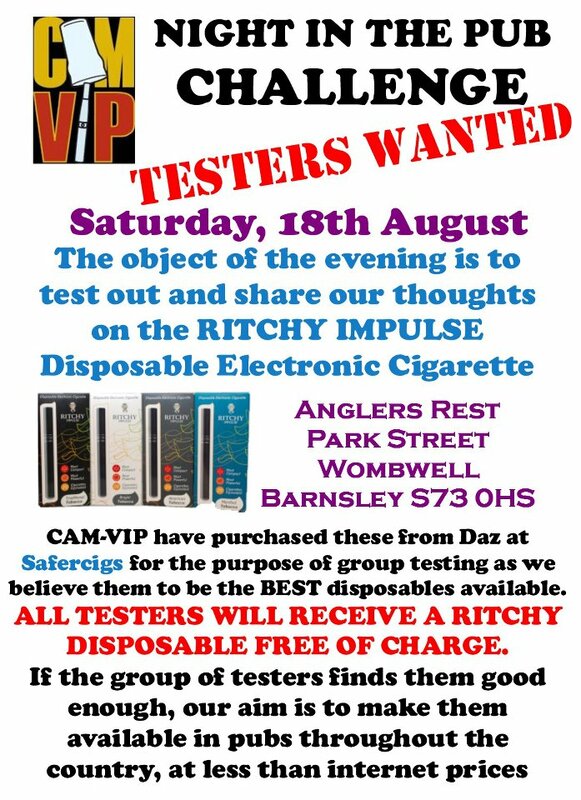 We have had quite a bit of interest from retailers and vendors recently who wish to use the CAM-VIP banner to supply their electronic cigarettes to pubs. This is the purpose of CAM-VIP and we would like to encourage those people to use the resources we have here to do just that. All the images and promotional material that we have developed over the last 2 and a half years can be used by anyone free of charge. The map of vaping pubs can be used to approach vape friendly pubs to stock your products and we will list your shop/website on our links page at no cost. All CAM-VIP asks for in return is that you keep us informed of your progress. If you use electronic cigarettes, we need to hear from you! We are hoping to get the Winter Edition of our online magazine 'Vapers InAle' out before Christmas but we need articles. The CAM-VIP magazine is about the lifestyles of electronic cigarette users, NOT about the products they use. We are interested in YOU, your story, where you live and what you do. Tell us about your experiences, your funny stories, your passions and your favourite pubs. The magazine hopes to show that there is a whole new community of normal people who have stopped smoking tobacco and switched to ecigs. It intends to show the doubting smoking public and decision makers that this life style choice has a positive impact on many people's lives. Please contact me via email or pm and share YOUR story. Evidence needed - does allowing ecigs increase pub custom? Getting licensees and breweries to allow vaping in their pubs has been a struggle - but we have managed to identify over 500 that are quite comfortable with it. The next stage is to present some evidence to the breweries/pub chains that it is worth while promoting ecigs - from a financial point of view. Does anyone here run a 'vaping pub' and has this made any difference to your foot-fall? 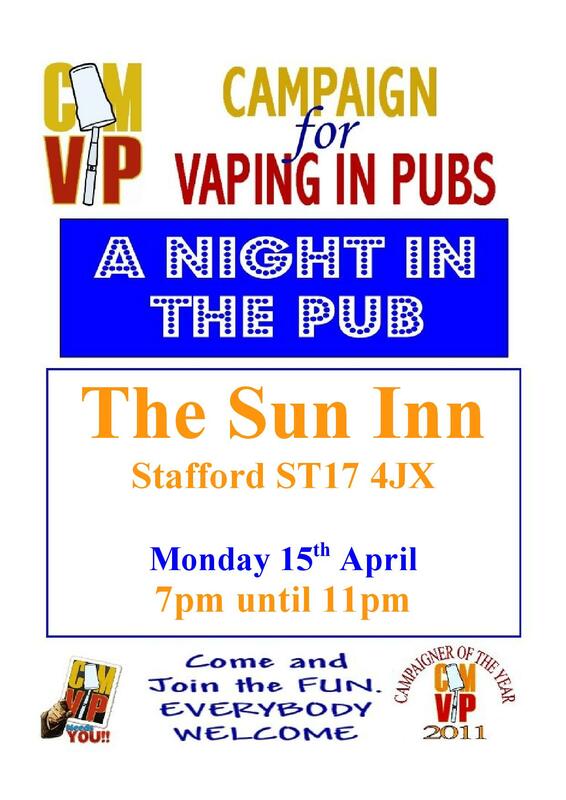 If you are a vaper who regularly vapes in your local - has there been an increase in people using ecigs in the pub and increasing the turnover? We need more than anecdotal evidence from us to convince the people we are trying to get on board - after all, they are businesses and will only be swayed if they see an improvement in sales/profits. e need publicans to tell us of their experience. If you can help, please post below or contact me via pm/email. The list of vaping pubs is about to grow massively, for the simple reason that we are going to use CAMRA's 'Good Beer Guide' to add to the map. 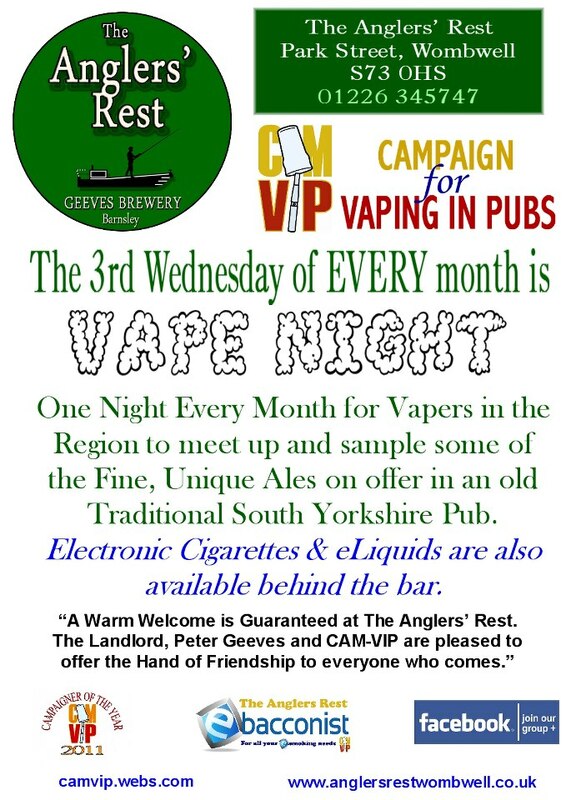 This means we need to differentiate between the vaping pubs to channel ecig users and potential customers to them. If Yes, what brand(s) does it sell? This will hopefully make the map much more useful for everyone and will provide a springboard to promote ecig use and pubs that support it. Issue 1 of the Vapers InAle magazine is now at the printers - 500 copies due by next week. A big thank you to all those that contributed with their time and/or money. It will be available at The Anglers Rest next saturday and at Vapefest the week after - priced at £2 each (plus optional additional donations). 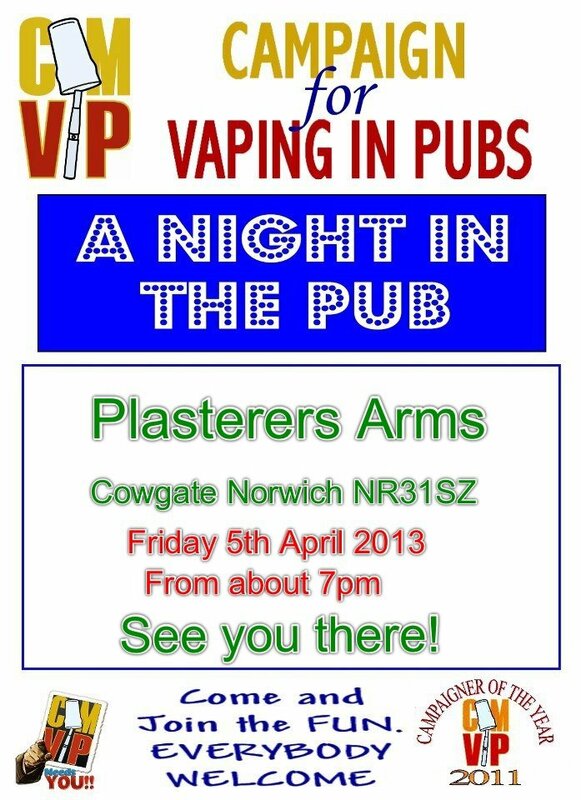 Any money raised will go towards a second print run so that we can get them into 'vaping pubs' free of charge. Is the Ritchy Impulse a disposable that satisfies the needs of a smoker/vaper whilst out for a night IN the pub? Come along and find out for yourself. To support our attempts to increase awareness of electronic cigarettes to pub going smokers, we will be compiling a quarterly eMagazine that can be printed off from the site and taken to your local. 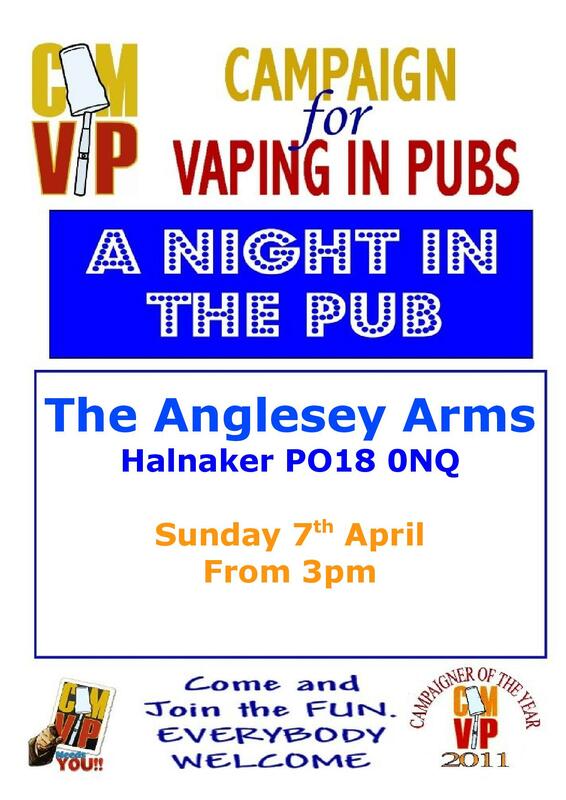 We realise that many smokers and publicans are still unaware of the growing 'vaping' community due to its predominantly online nature. 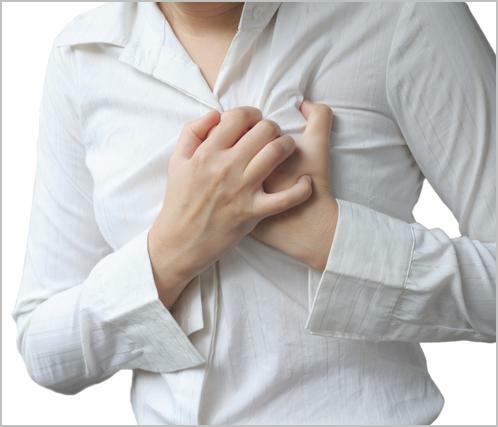 The eMagazine is an ideal way of getting the information to them so that they can digest it in their own time. 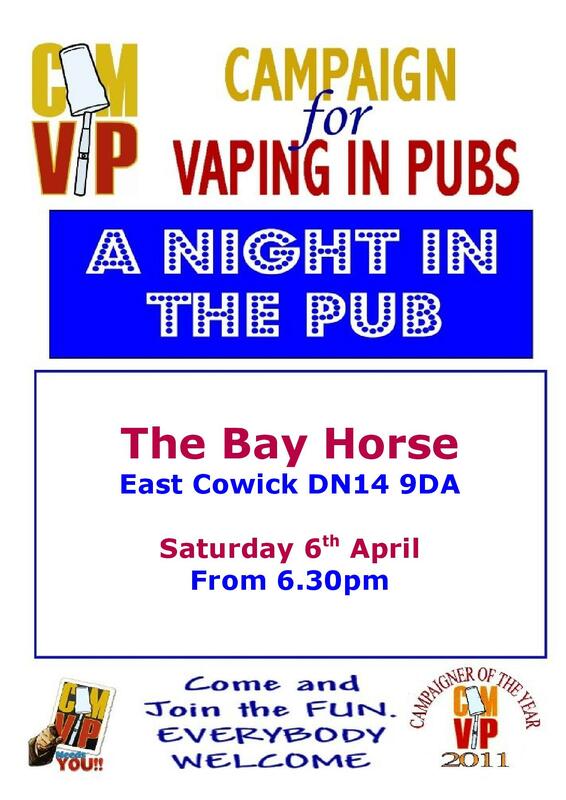 Hopefully it will dispel some of the myths about electronic cigarettes, inform them of the issues regarding smoking and its alternative, promote community pubs that have embraced ecigs and more importantly entertain them. The CAM-VIP eMagazine will also include pub related features and articles as well as a healthy dose of humour. If you feel that you can contribute in any way, please contact us via the website. We hope to have the first issue ready for download by the 1st August 2012. Smokers and traditional community pubs are both on their death-beds waiting to die or to be killed off by the Government. Do they care? YES Are most of them actively doing anything about it? NO Why not? The slogan of the 21st Century!! If they CBA - why should anyone else BA for them?